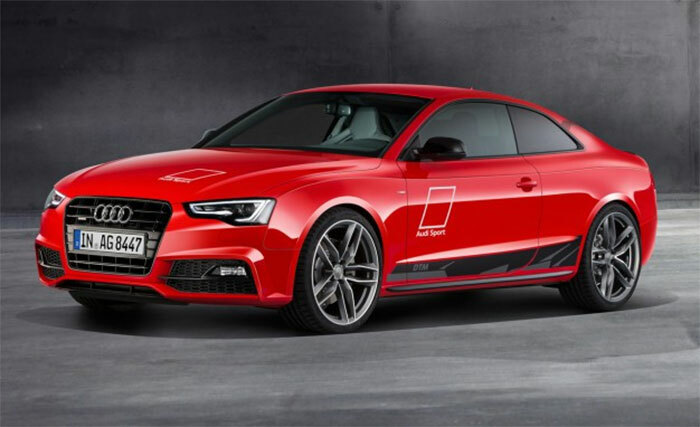 Audi has announced a special edition A5 that will be offered in a very limited edition in Europe. The special car is the A5 DTM and it is designed to celebrate the Audi DTM racing effort. Power for the car comes from a 3.0L TDI engine making 245hp. As you expect from a diesel V6, there is a copious amount of torque on hand with 428 lb-ft.
That V6 is mated to a 7-speed wet-clutch S-tronic transmission and the power goes to all four wheels via Audi’s Quattro AWD system. The large diesel V6 may be modest on horsepower, but the car can still reach 62mph in 5.9 seconds. All that torque certainly helps that acceleration performance. The A5 DTM is limited to 155mph top speed. Inside the car has a fancy interior with RS seats that have backs painted the same Misano red color as the body. Other red trim bits can be found inside the swanky interior. The car even gets projectors in the doors that shine DTM on the ground when opened. Pricing is unannounced, but expect it to cost well over the normal A5 price.